To download the whole huge poster itself, click here. This page here has all the WORKSHOP HANDOUTS for seminar participants, private devotions, etc. and a few practical instructions for leaders. The presenter needs to read and comprehend the material under the ‘BIG PICTURE’ tab at the top left of the website! Everything below here is just commentary on that page. Similarly, if you watch the first few minutes of the ‘TOP LINE’, ‘LIFE’ and ‘REST’ videos you will comprehend everything below here much more easily. These are the March 10th, 17th and 24th videos, respectively. The ‘LIFE’ video (March 17th) has a quick recap of the ‘TOP LINE’ in the first few minutes. You might choose to run the SSoG over 8-10 weeks at about an hour a shot, or all at once over 7-8 hours. The videos show one way to run it over 10 one-hour sessions. The workshops are run in a way that involves participants a great deal. The handouts are the key to this. Around ¾ of the whole seminar is delivered by participants teaching from the handouts! I don’t warn them about this because they would not come, but everyone that comes does it and has fun. Once they discover that they can decode and present all manner of bible stories coherently, they are delighted! The presenter will normally (prepare and) present the Top Row, then the ‘LIFE’ Stream, and then get the participants to take one page of the ‘REST’ Stream handouts each (or per team) and ask them to present the one they have after a ten minute prep time. (Tell them they can ask you for preparation help!). You have to do the math to divide the eight handouts in each row out among the [n] participants. The presenter needs a reasonable grasp on every picture because they occasionally get asked to help someone prepare and/ or they have to cover for people who mess up or don’t get their picture. the Images-&-Texts for every stream (rows 2-8). The former would not normally be ‘Handouts’ except for the presenter’s own preparation and speaking notes. Start by physically setting up the giant SSoG Poster on a wall or frame, or on the floor if you will have less than ~25 people and you have no useable wall. Look at some photos under the ‘BIG PICTURE’ tab to see different ways this can be done. Cover or otherwise hide the seven stream titles in the left hand column of the whole poster. Reveal these one at a time through the day to maintain tension and excitement! The handouts for each of the seven theme-streams (Life, Rest, Rule, etc.) each contain an image and the relevant text. Participants/ students use these to understand how various bible texts fit together as examples of God making a STREAM come true in an ERA. The picture paired with that text is an aid for teaching. The picture ‘carries a thousand words’ to help the students pay attention, the teacher recall and the students remember. 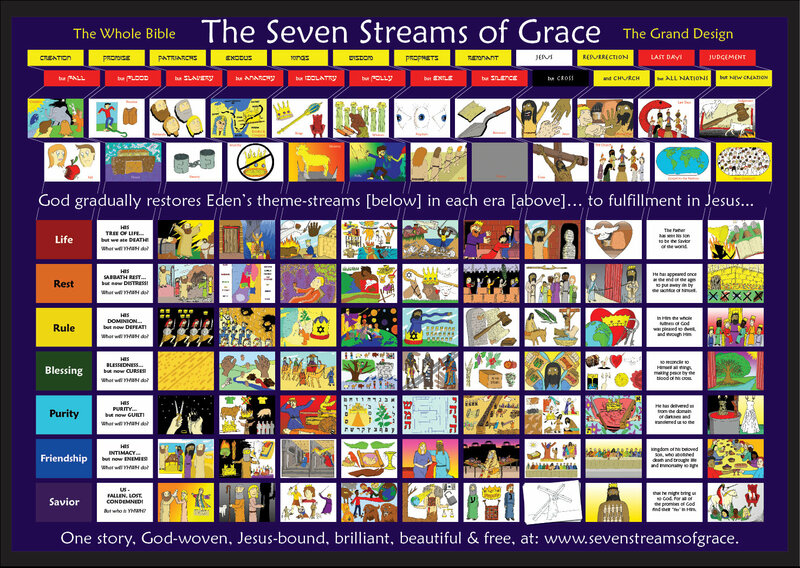 You might or might not need to describe how the Seven Streams of Grace works as a giant chronology and matrix. People will discover it as you use the “Now it came to pass in the time of the…” formula that is described under the ‘How does a SSoG seminar…’ heading on the page under the ‘BIG PICTURE’ tab. If you know you want the entire set, just print the whole PDF from the above link. However, if you want it for yourself rather than as handouts, buying the SSoG book itself is probably easier and cheaper. It has a nice color cover and perfect binding too! It is here, and as an e-book here. I rarely use the handouts - I just buy a big batch of books (thus saving a bit via bulk mail) and have each person buy, use and keep their own copy. In poorer communities the handouts are necessary unless someone sponsors the book purchases. (Select these page numbers below - not the numbering of the pages shown on the printed sheets themselves). Go to the page http://sevenstreamsofgrace.com/orderPoster/index.html and look at the heading, "Download all the Artworks". I’ll post them as you write them! Watch the video and imitate; write Teacher’s Notes and I’ll post them here! It can be fun to start the seminar by handing out cards (cut up photocopies) with the top line of pictures on them. It is fun for people to scramble and sort them to test and fix their basic bible chronology. It also helps them learn the big time hooks for the rest of the whole poster/ program. If you want to do this it involves more printing & cutting preparation by the presenter. cut lots of copies of each sheet on a brilliant guillotine and set out piles of each type of card (24 piles), asking people to take one picture off the top of each pile to make a set. The text for these is in the TOP LINE MILESTONES Handouts doc above.